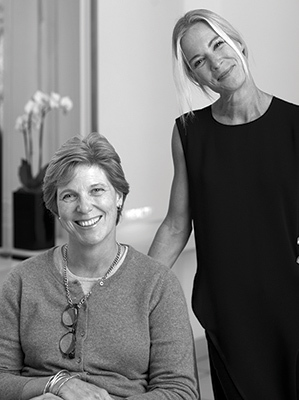 When asked to think about her very first client to feature in our 50 Years Together magazine India Miller immediately thought of Sophie Tulloch and as the photo highlights the smiley duo are very happy in each other’s company. Let us introduce you…. ‘I used to get my hair cut in London but I had this fringe that was driving me crazy so I walked into Stafford Street and got an appointment with India. She’d just become engaged to Jason and was starting out in her career. I thought she was one of the nicest people I’d met and she completely got what I needed. ‘Sophie has been a really easy person to get to know as a client. We immediately clicked from the very first appointment. We have a comfy, flexible relationship. In a way we’ve grown up together. We’ve gone through the birth and parenting of our children together and now there’s an unspoken friendship and care for each other. Charlie Miller Hairdressing has five luxury salons across Edinburgh. Find us at Frederick Street, South St Andrew Street, Holy Corner, Ocean Terminal and Stafford Street. It’s easy to book online using our app and you can view our price list here. We hope to welcome you soon. Keep up to date with all our competitions, offers, news and stories by joining us on Instagram, twitter and Facebook. Search hashtags #cmhairdressing and #50YrsTogether.